A cute little daisy for the rock garden, forming a low carpet of very fine, ferny grey-green leaves. Short stems of white daisies appear in late spring, each with a yellow eye, the petals often painted red or purple on the back. Very drought tolerant, once established. Best in a rock wall or gravel garden, also nice in containers. This is a particularly compact and dense selection, excellent for edging. Blooms continue well into the summer, showing colour at a time when so many other rock garden plants are long since finished. Not a long-lived plant, but will self-seed where happy. 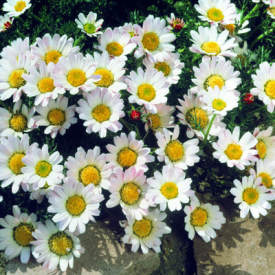 A cute little daisy for the rock garden, forming a low carpet of very fine, ferny grey-green leaves.